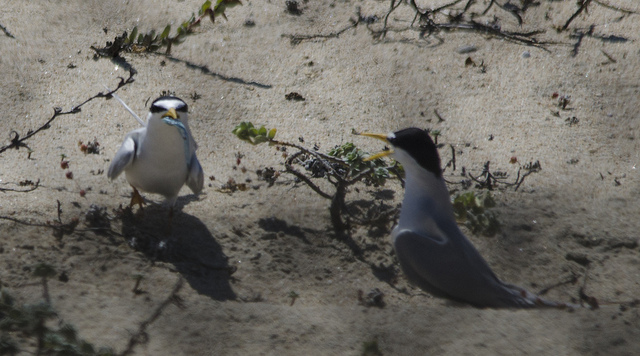 1) The Least Terns arrived like clockwork in April at the Venice Beach colony enclosure. As happens every year, predation of the eggs by crows is happening, but the terns are still doing their best, and they’re definitely roosting there at night. The terns seem to be spending a considerable amount of time away from the colony, which may possibly indicate that food resources are not conveniently close or plentiful this year. In short, we’ve done what we can to make sure the Venice colony enclosure has great habitat for nesting, but there are factors out of our control (crows, food resources) that definitely affect the terns. 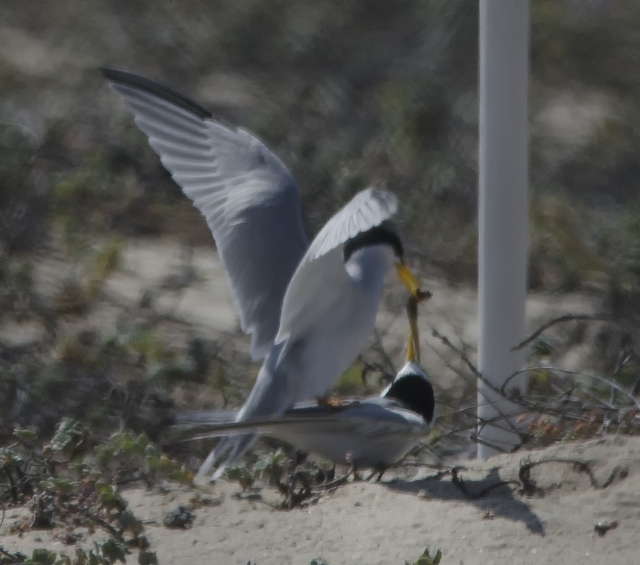 We’ve been told that other colonies in Southern California have also experienced lower numbers of Least Terns this year. 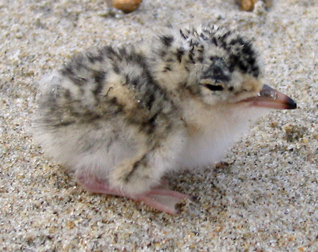 As the nesting season progresses, we will likely start to see groups of Least Tern adults and fledglings from other colonies arriving at the Venice colony and adjacent beach in mid to late July. 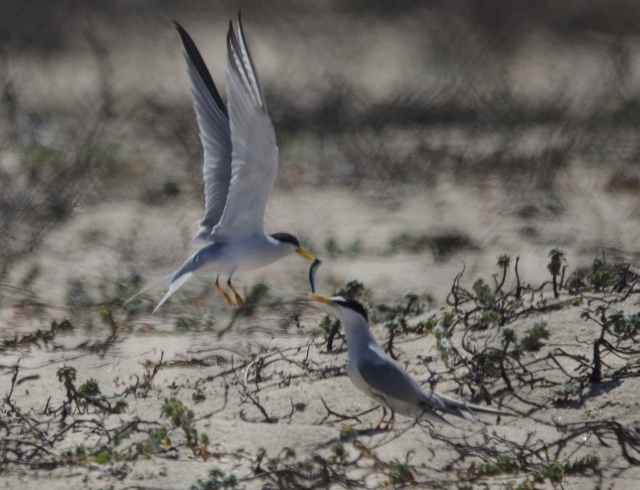 To ID the fledglings, keep an eye out for the Least Terns that don’t have the crisp uniform of black cap and yellow bill – juvenile Least Terns are pretty much adult-size but they’re sloppier dressers. 2) Crows… Every year they present a challenge, and every year we get lots of questions about them. Crows and their relatives, ravens and jays (collectively called “corvids”), can be predators pretty much wherever their range overlaps with any other nesting species. Whether it’s plovers and terns on southern California beaches, marbled murrelets in Pacific Northwest forests, or baby tortoises in the Mojave desert, predation by corvids can be a real problem. They are extremely smart and typically well-adapted to humans and the way we alter the landscape. In Los Angeles, we have created excellent crow habitat where none previously existed by replacing coastal sage scrub and wetland habitat with lawns (which means year-round water and invertebrate food sources), trees for nesting, and plentiful food waste. We have worked with wildlife management agencies at the Venice site for years, and everyone is very well aware of the problem. The final four photos on this blog were kindly shared with us by Wendy Miller, Least Tern Monitor Volunteer at the Huntington Beach colony in Orange county. Check out the rest of her many photos here on Flickr. I have also placed a permanent link to these photos in the “Bird Links” section on the right sidebar.